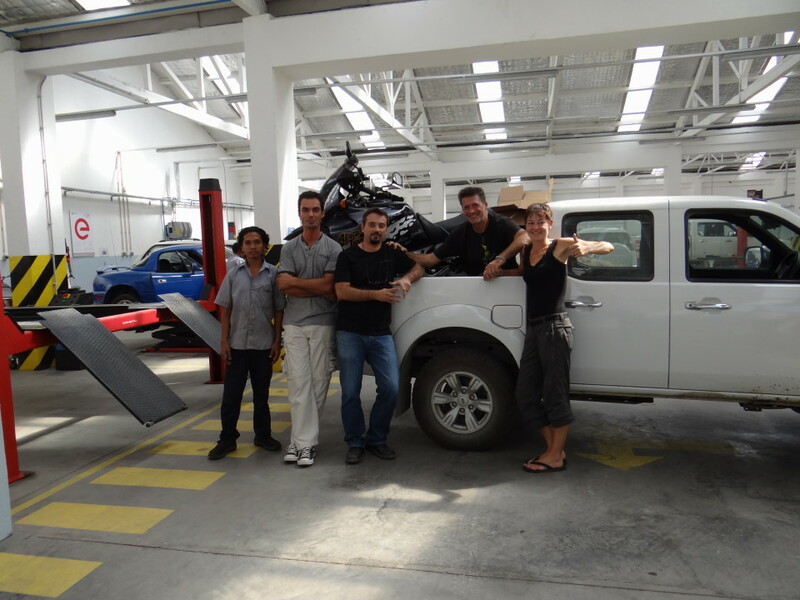 We did more than 100.000km on three continents with the C3´s and did the one or the other drop with them. It was clear that we have to have flip-up helmets again. 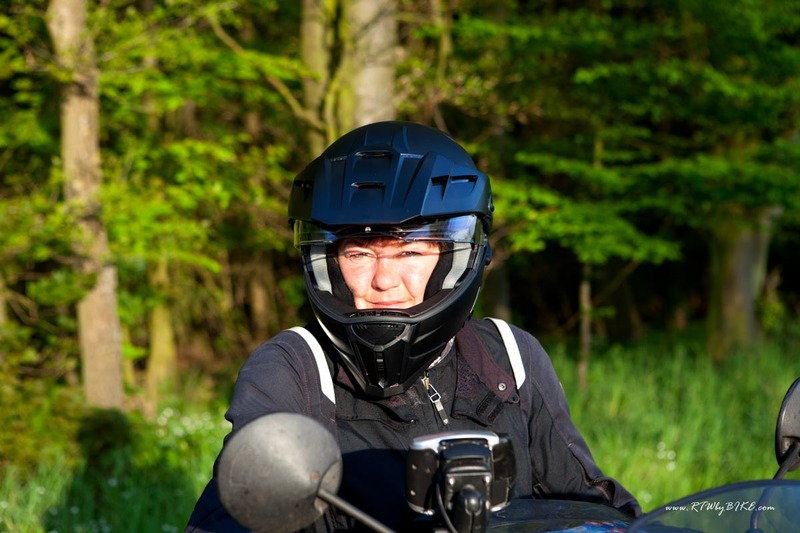 When you are travelling on a bike the first thing to establish contact is your face, in my VP45-Tankbag there is always the camera in easy reach and with that flip up functionality you do not have to take off the helmet to make a picture. There we are, already at the first big advantage; when the Aventuro Mod was created one idea was exactly to merge this in the design, so the field of view of the helmet was designed a bit wider when you flip it up so it does not interfere with the camera. 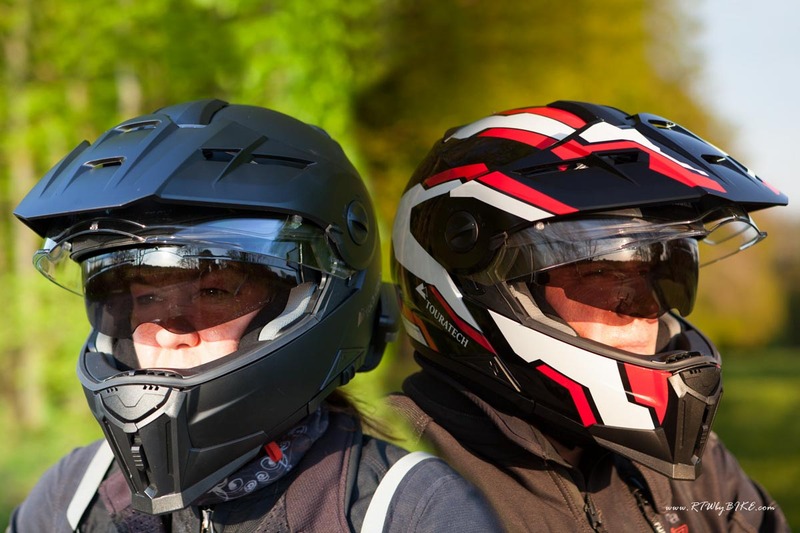 We always think about safety and comfort at all your safety gear, and because we have been satisfied with our old Schuberth’s for some years we believed in staying with them. So we looked at their range of helmets and found that something, somewhere was missing to fit our needs 100%. And then suddenly we saw the Aventuro Mod, made by Schuberth in cooperation with Touratech. The improvements they made sounded fantastic, the first big point we saw was that the air flow was increased dramatically and that was one downside of our long-standing C3´s, sometimes in Asia or Australia we thought that our brain is well cooked. Even everything else which was outlined in the description of the helmet sounded absolutely great, it looked like somebody have actually asked us how to build the perfect fitting helmet for us. The designers thought this entirely through to make it fit for various settings. 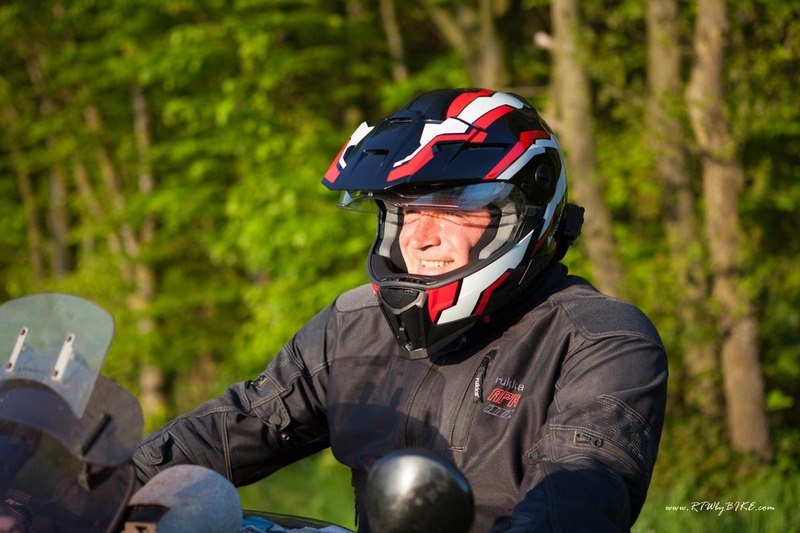 Within 10 seconds you can completely remove the Shield (which turned out to be very useful if you have to go for some km´s on the highway), the same goes for the visor, you can take it off and mount off-road goggles if you like. Of course the integrated sun visor, which we already knew from the C3, was built in once again. Another great feature is the build in filter for the front ventilation which protects you from dust and insects. The inner lining is out of COOLMAX® and is completely removable and washable which is very useful especially if you are riding for days and days in a dusty and/or smoggy environment. Sometimes we wear our Helmets for about 10 hours a day so we have looked for something which is not only safe but it has to be comfortable as well. And what should we say, we didn´t had the chance to try them before our first (little) trip and just got the sizes we had before with our C3´s, and lucky us, a perfect fit. Of course the old ones have been, after 6 years and more than 100.000km´s, a bit out of shape. Therefore the new Aventuro Mod´s felt a bit tight at first, but after some hours they adapted to our heads. When you look at the details of all the innovations there are a lot of thing you do not realize, such as that the shield flips up together with the chin protector and comes automatically down again to the present position is something you do not realize at first but makes life uncomplicated cause you do not have to take care at all and just can flip it up when ever you like. If you want all and every of the technical details, you can find it here.